Here is visual proof that patience is rewarded. 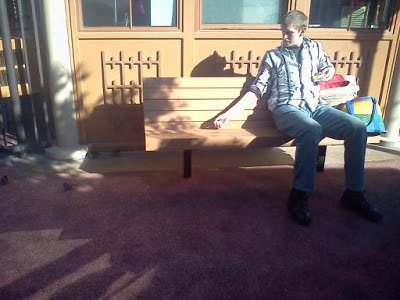 When we visited Las Vegas, my son, Bron, sat on a bench for a long time, coaxing what we call "parking lot birds" with tidbits of cookies. (We call them parking lot birds because we notice them mostly in parking lots, hopping under cars and around cart return stations, pecking up the goodies that small travelers drop through the cart wire.) I don't think Bron moved a single thing except his arm and his eyelids while he waited for what he wanted to have happen, and happen it did. I saw an inspirational cartoon recently that showed a side view of two men tunneling through the ground toward a diamond mine. One man was only an inch away from the diamonds, but had turned away and was heading back down his tunnel, while the other man was still digging with energy and enthusiasm. Guess which one got the diamonds? What is your diamond? Are you still going for it? Something funny about me is that because I'm so tall, there were times when I felt like a big gorilla in high school. (I'm just half an inch shy of six feet, but I generally wear my hair up or at least have puffy bangs, so considering the hair, I'm usually good to go for over six feet tall.) 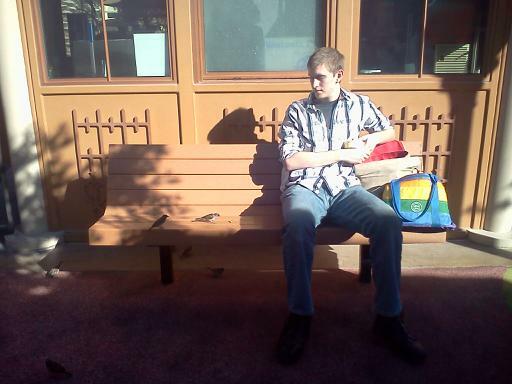 Now when I look back at pictures from my "I'm so big" era, I'm actually quite slender. My gorilla-ness was all in my mind. 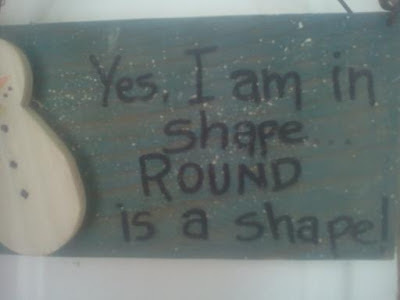 Now that I'm wiser, I realize that when I spend some time exercising (swimming last night... lovely!) and when I eat good food, I feel just fine, no matter what the scale says. Guess how this applies to writing? It's because this type of progression and change in thinking is essential for good characters in your stories. They can't be the same gorillas they thought they were at the beginning. By the end of the book, they need to realize they can be round snowmen and still melt happily ever after. What have you learned to love... or at least accept... about yourself? When my 5-year-old niece asked how long we were going to stay at her house (she likes to play with her cousin Monkey) I told her we had to leave to visit Grandpa Bahlmann. "Who's Grandpa Bahlmann?" she asked. I explained that he was Monkey's grandpa, and he was in the hospital, so we were going to go see him. My niece's face fell. Looking up at me with concern in her round blue eyes, she asked, "Do you think he'd like a heart?" "I think he'd love a heart," I replied. 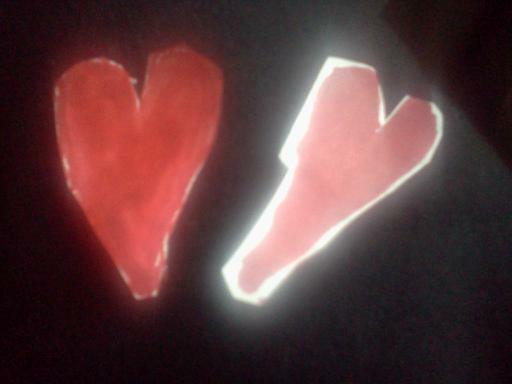 So she got busy with her markers and scissors and made a grandpa that she didn't even know two hearts in the hope that they would make him feel better. My niece's selfless action was quite touching. I would expect most 5-year-olds to just shrug off an unknown grandpa. But this little girl put her energy into sharing love. When we left, she said, "I hope Grandpa Bahlmann gets better." When we passed along the hearts to Grandpa, he laughed with delight. We left them on his hospital bedside stand where he could look at them any time he wanted to. This type of unexpected warm, fuzzy behavior is a good element to include with characters in a story. It helps readers relate to them and care more about them. It's even better to include this element in real life. What plans do you have to show love this Valentine's Day? When my son watched me put on my socks before pushing my feet into shoes for a foray out in the frozen tundra, he asked me a good question. "Mom, what's the point of painting your toenails if you just cover them up with socks and shoes?" But lollipops are happy things-sweet and colorful. 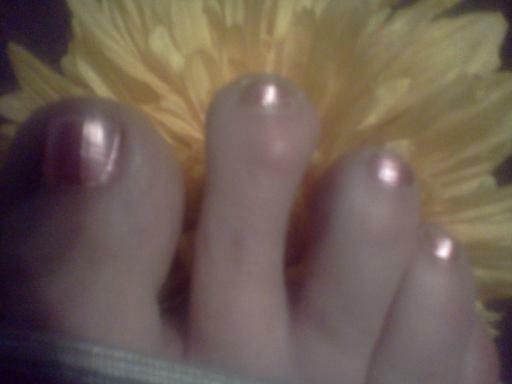 If I have funny toes, then they match the rest of me. Unique features are an integral part of writing believable characters in stories. Which of your features reaches less-than-Greek perfection, and what do you like about it?